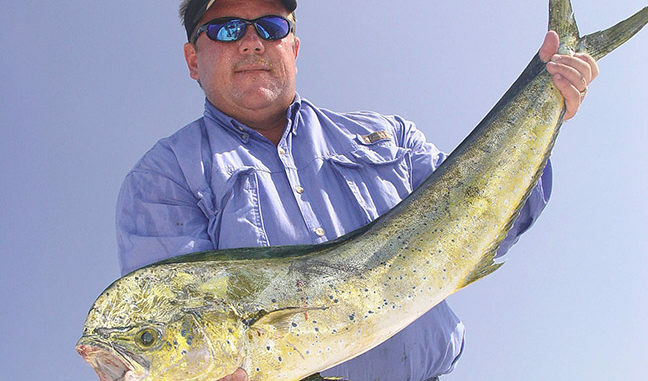 Call ’em dolphin, dorado or mahi-mahi, these sporty gamefish are built for speed and excitement. Capt. Ron Mitchell grew up around prime dolphin waters, but with most of his on-the-water time consumed by kingfish tournaments, the Raymarine pro from St. Lucie, Florida cherishes the time he gets to spend chasing mahi-mahi. Eager to make the most of each outing, Mitchell employs a two-part plan: find ‘em and wreck ‘em. More on that in a moment. For now, consider the dolphin appeal. For starters, this dazzling speedster offers some of the sea’s finest table fare. Throughout the dolphin’s range of Nova Scotia to Brazil those who love this game know it’s about more than a dandy dinner. Built for speed — up to 50 mph — dolphin can tuck their pectoral and pelvic fins into depressions for minimal water drag and catch just about anything they want to eat. Male dolphin (bulls) are distinguished by tall, blunt foreheads, as compared to the rounded heads of females (cows). And when it comes to natural beauty, few can rival the dolphin’s dynamics. Mostly a golden yellow fish, dolphin display brilliant blue borders along their dorsal fins, with iridescent blue/green accents and smaller blue spots extending along their backs and flanks. The dolphin’s broadsides are dressed with skin cells called chromataphores, which expand and contract to alter the coloration with a dolphin’s changing moods — feeding aggression, mating, irritation over a hook in the mouth — stuff like that. A boated fish quickly fades to a dull greenish yellow, but once you see that electric blue vibrance of a swimming fish, you’ll be hard pressed to find its rival. With one of the highest metabolisms and fastest growth rates in the sea, dolphin can reach nearly three feet in length in their first year. Fueling such growth requires dolphin to eat frequently and heartily. You’d think that conserving energy might be one of their strategies, but these fish live a fast-paced nomadic lifestyle and any thoughts of “conservative” go out the window when a hooked fish unleashes its repertoire of jaw dropping aerial acrobatics. Partial to warm waters, dolphin may be found off the North Carolina Coast during winter, but always in the Gulfstream’s balmy flow. Florida’s East Coast and all throughout the Gulf of Mexico offer consistent options in which finding dolphin means looking these major fish attractors. 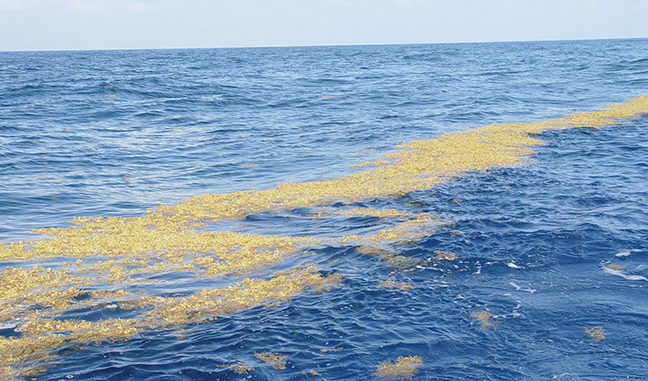 Weed Lines: Patches of golden sargasso weed floating loosely, often gather into tight banners of gilded grass amid which a buffet of crabs, juvenile sea turtles and baitfish hide. Flotsam: By way of storms and flood tides, the sea claims a rag tag assortment of natural debris from logs and palm fronds to manmade items like coolers, lounge chairs and plywood. It’s a random collection, no doubt, but a common feature links their dolphin relevance — shade; not so much for these pelagic predators, but for the baitfish they seek. Anything floating offers shelter to seagoing forage and savvy dolphin know the value of checking anything overhead for snacks below. Rip Lines: Converging water masses, form a frothy boundary at their meeting; typically with a temperature change of a couple degrees or more. Baitfish often hold on the clear, warmer side, so never overlook such dividing lines. Complementing these surface-level interests, don’t forget to look up. 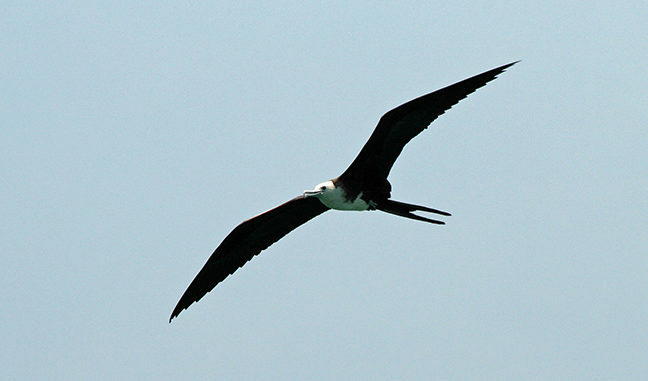 That’s right, sea birds — mostly the broad winged frigates — will trail dolphin and other predators for miles in hopes of picking off a free meal. One big dolphin, or a pack of smaller fish, may be working a school of bait and the frigate will follow him and wait for the chance to dive down and grab the dolphin’s table scraps. And therein lies a tried-and-true dolphin fishing strategy. 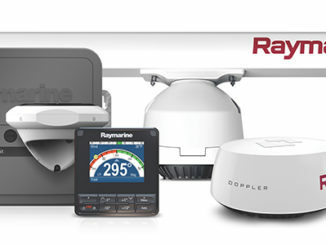 Along with strategic bird watching, Raymarine’s new Axiom and Axiom Pro units with their RealVision 3D technology will hasten the inspection of flotsam and weed lines. What was once only a top-down observation is now a thorough analysis of what lies beneath. 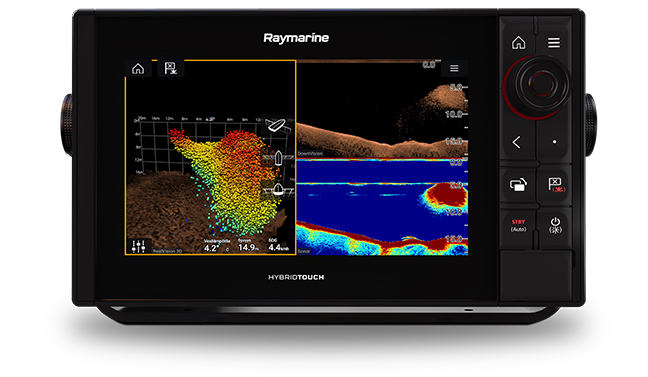 Raymarine Axiom 9 Pro reveals bait under a floating weedline. 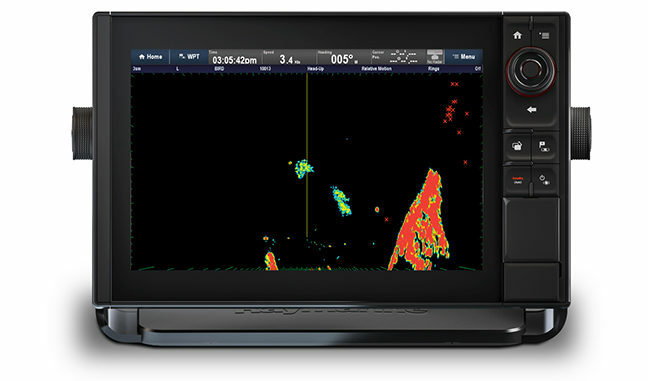 RealVision 3D shows the true position of the bait cloud, vs. the 2D sonar and DownVision views. And, as Mitchell notes, don’t miss the opportunities that may be circling below. While small to midsize dolphin are quick to explore the upper reaches of the water column, larger, more experienced fish often patrol 15-20 feet below the fracas until they’re convinced the opportunity merits the risk of ascension. Many times, anglers tussling with smaller dolphin near the surface will spot faint lines of brilliant blue patrolling deeper in the water column. Complement this observation with frequent glimpses at the sonar to stay ahead of the opportunities for maximum readiness. 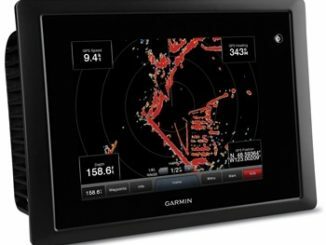 Raymarine Axiom Pro 12 displays the whereabouts of birds in full-screen radar view. As Mitchell points out, one of the most notable traits of dolphin behavior is their intense feeding competition. It’s more uncommon to see a hooked fish rise solo than to see a half dozen or more fish swimming alongside their struggling schoolmate — often literally trying to headbutt a bait out of the captive’s mouth. Entertaining for sure, but this behavior also works to the angler’s advantage, as attracting one dolphin typically means attracting many. Common is the practice of keeping a hooked dolphin in the water for a few minutes to rally a robust gathering; but even short of such strategy, it’s not difficult to keep a bunch of fired-up dolphin in the neighborhood — especially if you pepper the area with chunks of cut sardine, ballyhoo, bonito or whatever’s handy. Now, getting to this point obviously requires that initial connection and pulling a spread of baits past those weed lines, flotsam or rip lines beats the heck out of random trolling. A broad spectrum of artificial lures from noisy poppers to bubble making jet heads and even diving plugs will raise fish, but day-to-day, it’s hard to beat a dead ballyhoo. 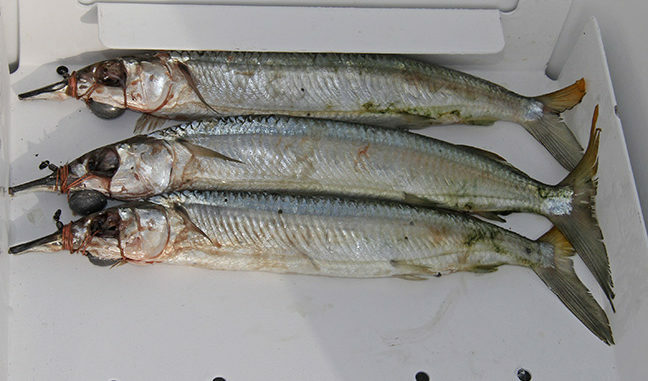 A slender baitfish with the odd design of a long, narrow bottom beak paired with a stubby upper jaw, this meaty forage species abounds throughout much of the dolphin’s southern range. Brining dead ‘hoos toughens their form and extends their trolling life, while dressing at least some in your spread with Mylar or colorful nylon skirts adds a little extra visibility that might catch someone’s eye from afar. 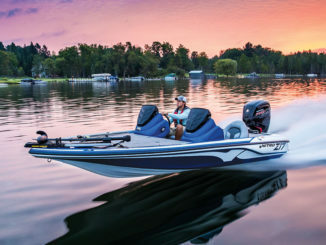 “I’ll troll naked ballyhoo too, but to protect the baits and to keep them weedless, I’ll use a Blue Water Candy trolling skirt on some of my bait,” Mitchell said. “I like the Jag in either pink or clear with blue accents. Mitchell said he’ll further expand his presentation by staggering the placement (line length and depth) of ballyhoo in his spread. 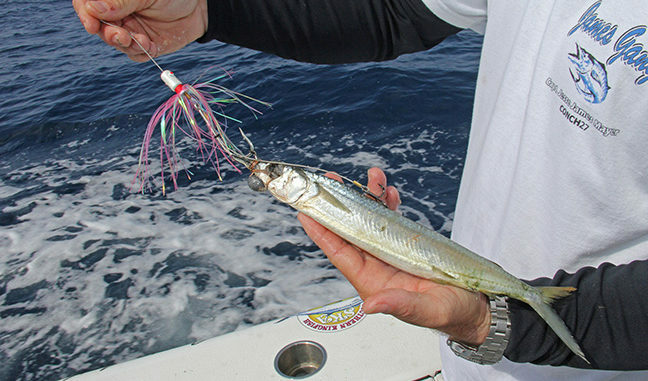 Running ballyhoo below the surface: downriggers or the more common option of wiring a trolling weight below the bait’s chin. Weighted or unweighted, ballyhoo last considerably longer when you snap off that lower beak and wire their jaws shut. And, while rigging ‘hoos with internal hooks has its merit, for simplicity, dolphin anglers tuck their hook under a rubber band wrapped around the bait’s head (similar to bridling livies). Once he scores a dolphin bite, Mitchell sets up on what’s usually a cluster of opportunity. From his experience, the best way to capitalize on the moment is to sling out a netful of live pilchards to concentrate whatever dolphin may be buzzing the area. He’ll follow by deploying three to four nose-hooked live baits on circle hooks and if the dolphin hold deep, a split shot helps sink the offering. 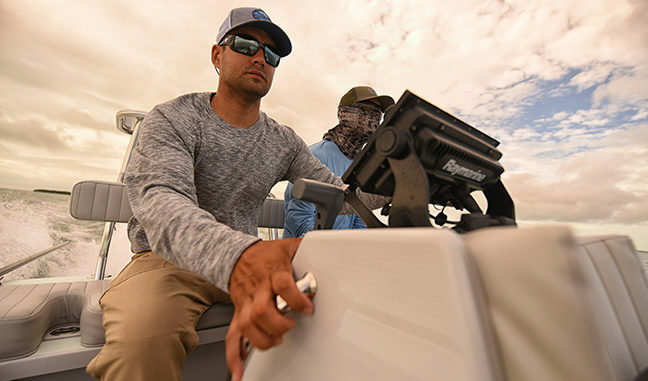 A simple game plan with home run potential, Mitchell’s tactics have been known to yield multiple hook-ups; and, while the flurry may seem like a whirlwind of confusion, just break it down to one fish at a time. When the fish jump — and they always do — try to rank them by size and work on the biggest one first. Steadily guide your fish to the gaff with a smooth cadence of raising the rod tip to move the fish and winding down to gather the line you gained. Once you sling your catch over the gunnel, drop the dolphin into cooler to preserve its freshness — a move for which you’ll thank yourself at dinnertime.